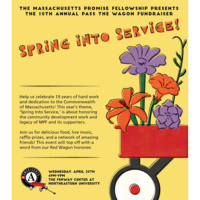 Come and experience an unforgettable evening with the Mass Promise Fellowship (MPF) as the program celebrates its annual fundraiser. MPF is a statewide AmeriCorps program that delivers the resources young people need to be successful in life by creating, managing, and leading meaningful out-of-school time programs for youth in grades 6-12. The program foci is on college and career readiness, and academic enrichment. At this event, you will have access to delicious food, live music, a fun and diverse network of community members and leaders across the Commonwealth, and raffle prizes! Located on the corner of St. Stephen Street and Gainsborough Street.